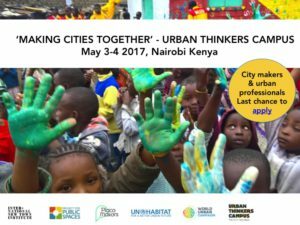 May 3-4 the Urban Thinkers Campus MAKING CITIES TOGETHER will be held in at the United Nations Office in Nairobi, Kenya. The conference is initiated by the International New Town Institute, Project for Public Spaces (PPS), UN-Habitat and Placemakers and is organized in collaboration with KUWA – Urban Spaces By People, and Architects Without Borders – Sweden. Together with invited moderators and speakers from all over the world we will acknowledge practical steps forward in order to create a sustainable world. We Will Make Cities Together. City Makers, Urban Professionals and other interested are encouraged to apply. 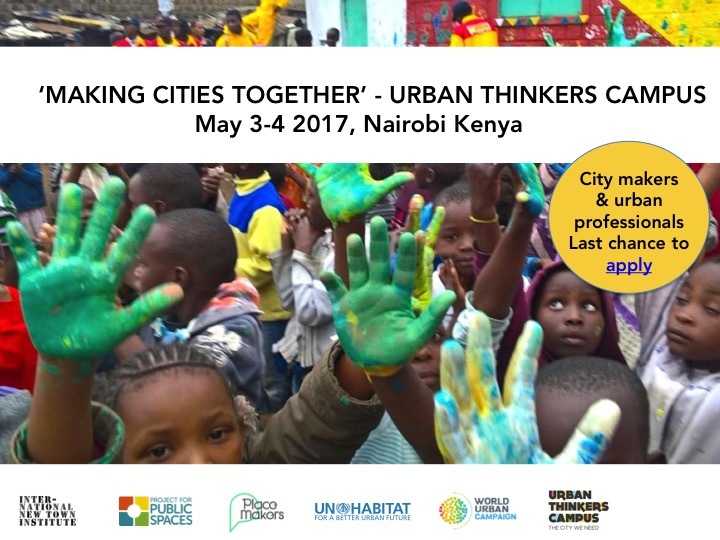 The Urban Thinkers Campus (UTC) model is an initiative of UN-Habitat’s World Urban Campaign, conceived in 2014 as an open space for critical exchange, promoting sustainable urbanization across the globe. In order to implement the New Urban Agenda after Habitat III in Quito in 2016, the UTC 2.0 will be action-oriented by focusing on developing action plans and implementable roadmaps for sustainable urban futures. In the ‘Making Cities Together’ Urban Thinkers Campus the development of public space takes center stage. High quality public spaces are excellent starting points for improving the standards of urban life for all citizens. They are instigators and symbols of important aspects of a city, such as safety, health, and the local economy. The UTC focuses on placemaking, the participatory processes to ensure the development of high quality and inclusive public spaces. This UTC offers participants the opportunity to actively engage in dialogues, Living Labs and networking sessions; learn-by-doing. During the Living Labs in groups the development of action-oriented frameworks regarding to the implementation of the topics and themes of the New Urban Agenda on public spaces and participation will be developed. The focus will be on placemaking, up-scaling & replicating, finance, maintenance and governance in public spaces for communities in cities around the globe. We will answer question on how you and your organisation can contribute to implementation of public space interventions, as tool for regenerating and planning neighbourhoods and cities worldwide. Architect and Activist working with urban planning from different angels, focusing on establish a close relationship between architecture and people, placing a strong emphasis on participatory planning from the very beginning. Das has experience from both small- and large scale urban planning projects in different socio-economic areas around the world. He is a public space activist that believes in the idea of public spaces being the foundation of city planning. PK Das was awarded with the Jane Jacobs medal in 2016 by the Rockefeller Foundation. The Medal is awarded to individuals whose work creates new ways of seeing and understanding cities, challenges traditional assumptions about urban life, creatively uses the built environment to make cities places of hope and expectation, and influences global understanding and application of Jane Jacobs’ principles. Town planner with extensive experience in managing and coordinating public-private partnerships. Currently she is the Chief Executive Officer at Cape Town Partnership where she has spent the last eight years managing, developing and promoting Cape Town’s Central City as an economically thriving, creative and valued public and private space in which to live, work and play. She has been central in Cape Town’s World Design Capital 2014 bid and sits on a number of national and international boards, including the International Downtown Association (IDA). Senior Vice President at PPS. Ethan works to support Placemaking organizations, projects, and leadership around the world to build a global placemaking movement. During over 18 years at PPS, Ethan has traveled to more than 800 cities and 55 countries to advance the cause of Placemaking and public spaces. Ethan has been integral to the development of Placemaking as a transformative approach to economic development, environmentalism, transportation planning, governance, resilience, equity and design. Architectural historian specialized in urban planning history, postwar architecture and contemporary urban development. Since 2008 Michelle has served as Director of the International New Town Institute (INTI) in Almere, the Netherlands. Under her direction, INTI has grown into an internationally known center for education and research relating to New Towns. The New Town Institute is focusing on what we can learn from already built New Towns in order to improve and create sustainable future New Towns. 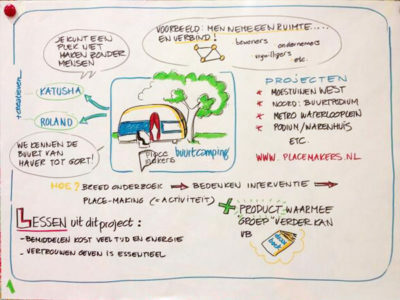 previous post: ZoZo Holendrecht: Paviljoen zoekt Plan!